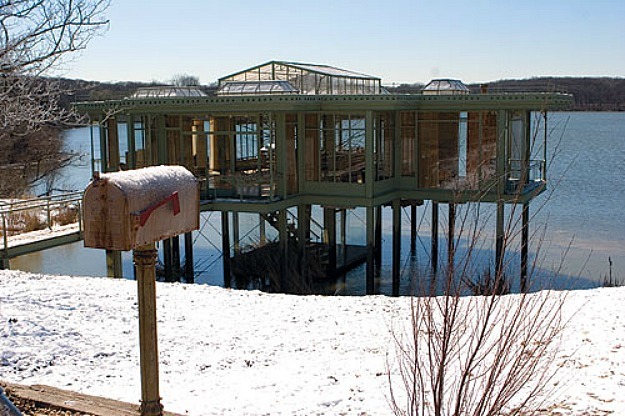 Let’s take a look back at the unforgettable glass house from the romantic drama The Lake House. Back in 2006, Speed co-stars Sandra Bullock and Keanu Reeves teamed up again for this remake of the South Korean film Il Mare about a doctor who falls in love with an architect she’s never actually met. Alex (Reeves) is living in 2004, but Kate (Bullock) is in 2006, which is kind of a problem. Here’s how they built that unusual house for the movie! They were granted the use of the lake for filming as long as the site was left exactly as it had been. That means the house had to be demolished after filming. After weeks of scanning lakefront locations in Wisconsin, Michigan, Illinois and Indiana and virtually every mile of the vast Lake Michigan shoreline for something that embodied all the necessary elements, The Lake House production team rose to the challenge and built the iconic house themselves. The house had running water, but no toilets. Crowley took the 2,000 square-foot structure from sketches to completion in just ten weeks: 2 weeks design and documentation, 4 days bidding, and a scant seven weeks for actual construction. 35 tons of steel and a crew of nearly one hundred was required to finish the house by the time filming was scheduled to begin. “The house was actually constructed on dry land next to the lake, atop steel beams that rose 10 feet above the waterline.” They excavated nearly 1200 cubic feet of soil and let lake waters flood under the pilings. “The house was our most important set, the one key piece around which the story revolves. So it made sense for us to create exactly what we wanted. We wanted a mixture of modern and classical, something that Alex’s father might have designed. Sandra Bullock said in interviews that she loved the house and hated seeing it demolished: “I was so disappointed that I couldn’t keep it, move it, and at least use it as a guest house somewhere.” Me, too! The production photos were provided by Triangle Modernist Houses. Sandra Bullock has been in some great “house movies” I’ve featured, like The Blind Side, Practical Magic and Hope Floats. Do you have a favorite? The Craftsman Bungalow in "I Love You, Beth Cooper"
This is by far my favorite post on your blog! It’s so, so interesting! Thank you for posting about it. I really like this movie too. Post of the Day : JENNIFER ANISTON’S HOUSE FOR SALE! HOW MUCH? How could you forget Practical Magic. Loved that post and that house. I have always always always loved that house! So interesting to get a peek at the history behind it! I really loved that movie too. I don’t often watch movies twice, or even buy them, but this one I did! Oh that Paul McCartney song when they’re dancing, swoon! Loved this movie so much, thanks for featuring it, how appropriate for V day! I loved this house…I can’t believe it was demolished, well I guess I can because my favorite movie house is the Practical Magic house and that was demolished too (although I think it was just a shell). Sandra sure knows how to be connected with great movie houses! Sigh, such a sweet movie. I loved the house – so neat to read some behind the scenes info. But also so sad the house was demolished . . . This is a really neat one, and I like this movie (SO ROMANTIC). The house reminds me of Cameron’s house in Ferris Buehler’s Day Off which is still on the market in the northern suburbs of Chicago. Happy Valentine’s Day house lovers!! How about the derelict house in “Murder by Numbers” or bungalow in “The Net”? This house reminds me of a green house in some strange Australian film set in the late 19th century that had it being barged, unsuccessfully, down a river. It’s probably the regency features in the ironwork. Yes, that’s with Ralph Fiennes and a VERY young Cate Blancette…Oscar & Lucinda. LOVED that movie! What a neat house. It was fun reading the different facts about it. Too bad the house had to be demolished. If Sandra Bullock loved that house so much, why doesn’t she build one just like it? She has the money. I wasn’t sure I’d like the movie, but it turns out I did! I love the house and am sad that they demolished it. Thanks for the great background information, Julia. I guess one could live successfully in a glass house like this if it were situated in an isolated location but I can’t see it being a big hit (unless you were something of an exhibitionist) in a city or suburban area. You picked a nice romantic film for today, Julia. Happy Valentine’s Day! Oh my – love this movie. Tried watching it a few times one weekend to help me grasp the story better, and finally decided – it isn’t meant to be “grasped” — just enjoyed & romaticized about… But LOVE the house & I was always so disappointed that more of it was not actually shown. Very interesting piece Julia! =) Happy Valentines Day! the movie definitely begs you to suspend disbelief and just enjoy the fantasy. it’s best considered as a “twilight zone” sort of tale. in essence, it’s a time travel story in which a woman in the present corresponds with a man living two years in the past. in the course of their correspondence they fall in love and the man locates her in the past, inserting himself into her personal history. after he fails to meet her in her time, they breakup for about a year. then she discovers that he has since died and realizes simultaneously that he was an unknown patient who’s sudden death propelled her to the lake house in the first place. she manages to send one last missive begging him not to make that fateful trip, but to wait another year and meet her at the house instead. and thus they meet in the present, two years from when they first began corresponding. i’d argue it’s keanu’s best acting ever. i mean, he kinda opens up and acts like a person instead of just cutting a dashing figure while better actors throw down. he has had an impressive list of co-stars over the years. arguably better than anyone, even tom cruise. this is the one movie where he doesn’t seem to be on camera. well, the story is pretty simple anyway. if they just wait, everything works out. it’s a shame they couldn’t have auctioned it off (to be moved) and donated the proceeds to (me…j/k) a charity or environmental group or some kind of organization attached to that lake. such a waste of a beautifully designed house. it’s really hard to choose, but the practical magic house is probably my all time fave movie house. I absolutely love the lake house. We have a little lake cabin and it has windows on three of the four sides. That’s why we bought it…for the windows. I love this movie and this house. The one thing I could never figure out is where is the attic, which is where the box of letters is stashed?? It’s pretty clear from looking at the house, that there is no room for an attic. This movie drove me slightly nuts, which in turn caused me to drive my husband nuts. Trying to figure out what the heck was going on almost took away from the house…almost. Don’t think I could live in a glass house, even in the wilderness, but it certainly looks appealing on that beuatiful lake. Love all the details you let us in on…your the best! Have never seen the movie but love the house. And what an interesting post. Loved all the information surrounding this fabulous structure. Thanks Julia! That house is the ONE REASON I like that movie! Happy Valentine’s to you! Sending a hug your way, for all the work you do! I haven’t seen this movie but the story about the house is fascinating. So sad that it had to be torn down and that you couldn’t get more pictures of the interior. No toilets? What a shame! I would live there forever if not for that! When my husband and I were first married (1965) there was a glass house near where we lived in Scottsdale. On Orangeblossom Lane. Fascinated me. I remember it looking a lot like the one you showed us, but smaller. It is long gone, replaced by a very ordinary subdivision ranch house. I adore and have always been obsessed with this house. I loved this house – couldn’t live there, not ‘cosy’ enough. The movie was a bit confusing, though. I always find time travel a bit mind-boggling and brain-hurty. I’m sure I read that Sandra Bullock did try to build a house like this but had to tear it down, something to do with planning permission or regulations of some kind. I’m just off to Google it….. Here it is, it wasn’t glass, and she had nightmare builders. And I can’t make a hyperlink, so you’ll have to cut and paste. Wow! That really does sound like a nightmare. Thanks for the link! My favorite post of the entire site is Practical Magic. I wish I could recreate that house one day. Not to be trite….but it was magical. So many people loved this movie? Well, now I’ll have to rent it. A house like this would be perfect to use the privacy glass that can switch from clear to translucent with a flick of a switch. Julia, I loved that movie…thanks for giving up the skinny on the house! 🙂 Hope you have a great Valentine’s Day! If you love all the glass in this movie house then you MUST SEE ‘When A Stranger Calls’, the one from a few years ago…THAT HOUSE IS SIMPLY A-MAZING! I’d also never watched ‘Practical Magic’, but just looked at your post…it’s very nice. I especially love the kitchen with the apron sink, the AGA stove, and that great dutch door in the back of the kitchen. What an awesome attic, too! Just looked up the house from ‘When A Stranger Calls’, it was re-made in 2006…the Mandrakis House is the one that is TO-DIE-FOR. Everyone, GO RENT THIS MOVIE. It’s scary, too…which makes it even better! So interesting, I didn’t know it wasn’t a “real” house. I, too, was frustrated throughout the movie (which I love and own) that there isn’t more opportunity to see the house. It could have been spectacular if it was allowed to be a character in the film. Great post!! Loved this house!!! Thanks for the story behind the house. So sad that it had to be torn down. Hi Julia thank you for this great post I loved the movie and the house and I agree didn’t see enough of the interior but the exterior how beautiful especialy in the snow. It is sad that it was torn down…how could they? I could just imagine how amazing it would look at Christmas time. Till next time Regards Esther from Sydney. This house is so uniquely beautiful. I dream of living by the water someday and I can only imagine how fantastic that house would be. It’s a shame they demolished it, what a waste. I’ve never seen the movie, I don’t think I’m smart enough to understand it, but now I’m really intrigued. What a cool house! Great post Julia! Seriously, Sandra has had some great houses in past movies. I didn’t realize the Lake House was made especially for the movie. What a waste! But the dad in the movie has a point. It’s not exactly cozy. Haven’t seen the movie but I’d like to. The story reminds me of a Richard Bach book called Bridge Across Forever in which he talks about alternate lives/realities. very, very interesting…thanks for posting it! I have always dream of having a glass house. But then I realize that certain privileges will be completely obliterated. You’re life will be just like the TV Show “Big Brother”, everyone is watching. Second concern is security, what can a glass do? And Lastly, abrupt changes in the weather, seriously, below zero degrees. I avoided seeing this film (stupidly) due to the rotten review, trashing its “sentimentality”, which act I almost always regret! The house itself was very cool, but as someone wrote, the Regency style in it? I can’t see it. To me, “Regency” is Netherfield Hall in “Pride and Prejudice”! My mother had a real lake house in Southern Mass., on a beautiful lake, painstakingly restored by my father from a 1930’s “cottage” to a comfortable, 80’s mix of off-white carpet and casement windows on two sides. It, too, was on land (who would build one in the water?!). I love (almost) anything Keanu Reeves does, from “Bill & Ted” to the surfing FBI agent in “Point Break”, to the ditzy “That Todd” in “Parenthood” to his winning role as the amorous doctor in “Something’s Gotta Give”. My exceptions would be films like “Bram Stoker’s Dracula” (period stuff? NOT his strong suit, including “Dangerous Liaisons”). Sandra Bullock has an even stronger negative effect on me, partly because, other than her role in “Hope Floats” she simply does not play well, romantically. The house itself was a better “star”. But it seemed too cold, especially for a northern climate like Cook County’s, making the fake glass mansion on Cape Cod in “Sleeping With the Enemy” seem almost cozy! I was not troubled by the time glitches. No one who read Kurt Vonnegut’s “Slaughterhouse Five” and really loved it would ever question The Chronosynclastic Infundibulum (aka, “Coming unstuck” in time). I think that this is what happened to Alex and Kate, but unlike Billy Pilgrim, they did NOT end up on Tralfamodor, but in Chicago. Hmmm…someone like John Cusack’s character, “Rob” in “High Fidelity” might say, “What’s the diff.?”! 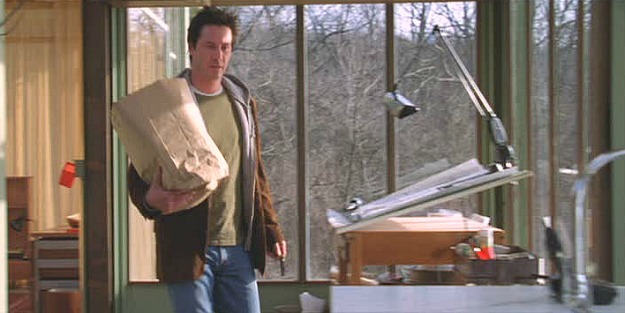 I was wondering if anyone might have information about furnishings in the movie the Lake House. I am looking specifically for anything about the company who made the iron bed that Sandra Bullock had in this movie. The one with the curved roman arch headboard and footboard. Any info at all would be greatly appreciated. Have been doing random searches for years, and can’t seem to find anything similar. I love this movie, and the house! Guess I’ve watched it 4 or 5 times trying to figure it out, but more importantly so I can have a big dose of Keanu. Thanks FOO for mentioning the unexplainable attic. When you look at the house from the outside the attic couldn’t possibly exist – there are no solid walls on the roof, just glass, yet when Alex climbs in the attic it’s all solid. I find this extremely annoying. Thankyou for your site Julia, it’s the greatest fun I have in the net! Angela, Canberra Australia. A very sweet & lovely film. Sandra is the most beautiful woman that shares this world with me. Even at a seemingly great distance we see the same sun and moon and breathe the same air. Oh well another place and time. I grew up in the area next to the lake, so this was a time-warp for me also. I spent many days around the lake and the surrounding forest area. I was really surprised the forest service allowed the house to be built.